Lurline's Place: Angels, Dollies, Rattles and Dilly-Bags! Yes, I've sort of been busy - my first little Angel! 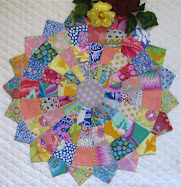 I think she is just gorgeous - this is a reduced size of the block from the Quilted Crow quilt. I'm going to use antique reproductions fabrics. Believe it or not, her dress is made from Regency Dandy, Circa 1810 and her wings a Judie Rothermal fabric. I will use all brighter reproductions in this little quilt - not sure where it is heading, but I will make at least nine appliqued blocks. Thought I would show you the little rattles I gave to my older twin grandchildren when they were born - that's nearly 13 year ago - a dear friend, who was an extremely talented egg-decorator made them for me from tiny bantam eggs. I had to pop to the shops to get some binding fabric for my Charisma quilt - of course, I just happened to see some zany brights that took my eye. 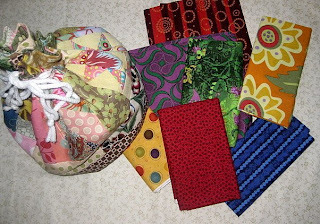 Now, I just love the dilly-bag Pat has given me, so I am going to solicit Pat's help and try to do the crazy, wonderful things she does with fabric. I don't know about you, but I am really quite naughty with fabric scraps - into the bin they go! So one of my resolutions is to keep them and throw them together to make useful articles. Have you seen Nanette's button on my sidebar - we are going to start our 2009 Christmas gifts early - do pop over to Freda's Hive to get in on the action! Maybe I will be able to help out if I can master these dilly-bags! 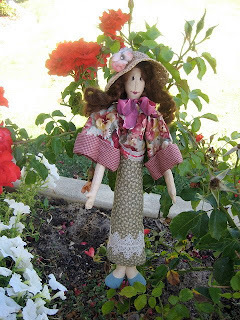 Terri, of Purple and Paisley, is quite intrigued with this little dolly of mine, so I thought I would show a photo of her on her own - I made her in the days when my painting skills were at top peak, just after I stopped making porcelain dolls - even her shoes are painted and of course, I had pretty wigs and hats to dress dollies in those days. Terri has a birthday on 7 January and so does Shari of Mummsyblossom's World - Shari is having a Giveaway - do pop over and wish both these girls a Happy Birthday! I have just the border to quilt around now on my Charisma quilt and then the binding to do, so hope to have a busy weekend finishing that off. It is still very warm here, so it will nice to be in the aircon! Your angel block is very sweet. I remember seeing this quilt at The Quilted Crow ... very nice. 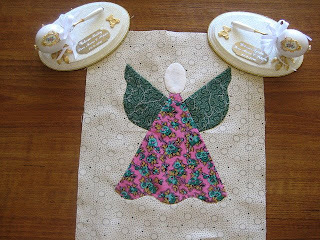 Looking forward to seeing some more angel blocks. Wish it was warm here .. summer seems to have overlooked us this year. She is a gorgeous Angel indeed. The fabric is so pretty. You make me want to wander around the fabric store and collect a lot of pretty colors! You are so talented and I so enjoy visiting each day. Noooo, don't throw out you little scraps. I have a box for my scrappy bits. The kids love it but I'm also saving mine to do a postage stamp quilt one day, I'll probably be ninety before I start it but I'll have all the fabric by then!!!!!!!!!! Your Angel is too cute & those baby rattles are Unique..never seen anything like them before...I have a very large plastic tub for my scraps couldn't bring myself to throw them away...that's a Sin.!!! wet & windy here...love it.!! Curses! I have just realized that Bloglines dumped you off my list! I thought it odd that you hadn't posted, but with all the hubbub over the holidays I just didn't think to go right to the blog. I'm all caught up now though! I love those little bags you've been making, and the Cabbage Patch Doll Bag was so precious! I'm glad you had wonderful holidays with your family. Are you doing Bonnie's mystery? Your first little Angel looks so pretty. Happy New Year, Lurline! Love your bright fabrics. I can see why Terri likes your doll. It is lovely. 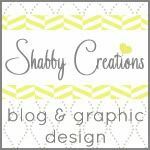 I am always amazed at what I see on your blog! Your work is just beautiful! Love those rattles too! So cute!!! Oooooo, I love this doll. Very pretty.